Bargouti, son of imprisoned Palestinian leader Marwan Barghouti, is currently in San Francisco. See CNN report on his activism: “Palestinians highlight prisoners’ strike with ‘Salt Water Challenge. 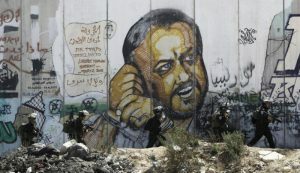 '” Marwan Barghouti wrote in the New York Times “Why We Are on Hunger Strike in Israel’s Prisons” on April 16 as the hunger strike was beginning. Also, see the Palestinian Prisoner Solidarity Network for more information, including details on ongoing protests around the world about Palestinian prisoners.